DO YOU FEEL LIKE SAILING IN MAJORCA? Yes, I feel like sailing! 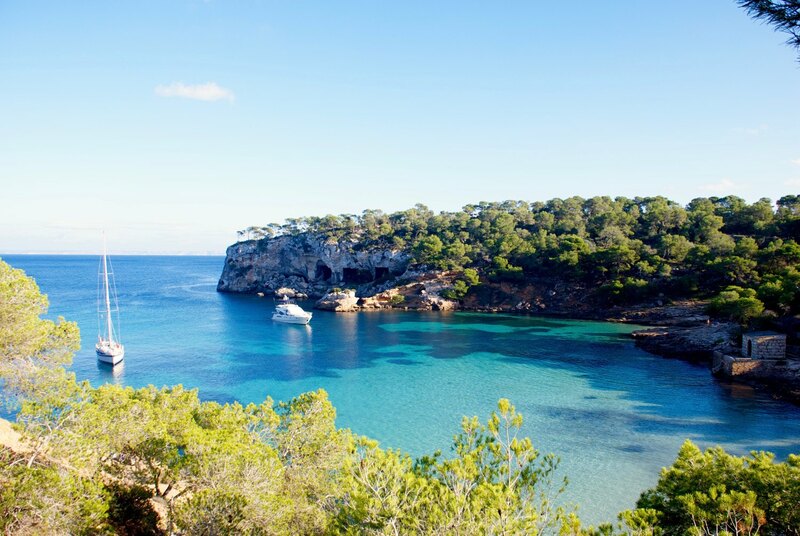 Majorca means white sand beaches, paradise coves and pine forests bathing in turquoise waters. The mallorcans proudly used to say that “Mallorca has everything”. And this is beacuse Majorca is a place where tradition and history, a charming country lifestyle, imposing maountains and unforgettable landscapes, surrounded by a sea of crystal clear water, live in an island to fall in love. If you are thinking about yacht charter in Majorca to enjoy a sailing holidays with your family or friends in a real mediterranean style, you are in the right place. In this post you will find out the most spectacular coves where anchor your yacht, the most vibrant chiringuitos where sharing a cocktail or the most amazing sunsets in the island. Are you in? Then, keep reading because this boat is about to set sail in a sailing week route around the south coast of Majorca. Why rent a boat to sail around Majorca? There are thousands of reasons why Majorca has become one of the most attractive spots in the world for yachts charters. The different orography of its coasts, from the rugged cliffs of the Tramontana side to the beaches of white sand and turquoise waters of the east side. From the calmed north coast to the vibrant south. From the nautical point of view, it is worth mentioning the wide range of marinas and moorings with all kinds of services for our boat, or if you prefer, a lot of natural anchorages where we can spend the night surrounded by landscapes that you will never forget. Some of the most prestigious sailing races in the world are celebrated in summer, such as the Copa del Rey de Vela. During those days the marinas of Palma have a nautical and festive atmosphere that will delight the fans of sailing. Its calm waters and pleasant weather make Majorca a unique place to enjoy a sailing holiday. Therefore, it is not surprising that it has become one of the points with the largest offer of boats for rent in the entire Mediterranean. When choosing a boat, renting a sailboat for a week to sail around Mallorca is the most popular option. However, discovering the secrets of the island by boat, catamaran or yacht are also very good choices. In addition, hiring a boat for your vacation does not mean that you can not get out of it. Majorca has thousands of plans to offer you. Explore the magical villages of the Sierra de la Tramontana, a world heritage site. 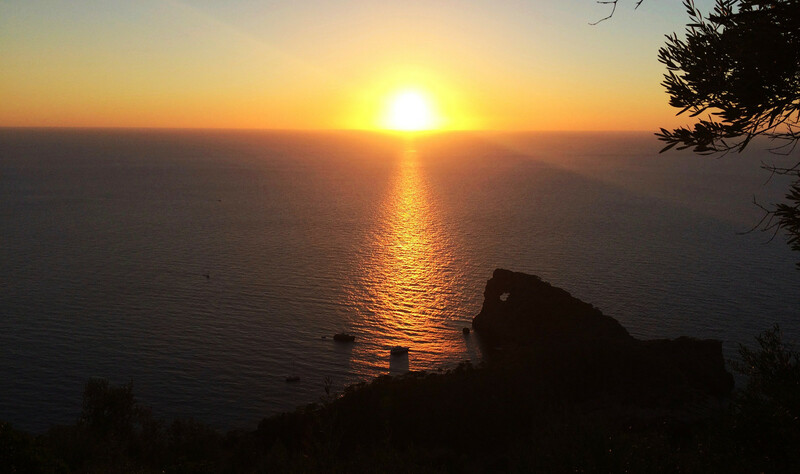 Enjoy an amazing sunset at Sa Foradada at chillout pace. Get lost in the craft market of Santanyí. Have a dinner in the lively neighborhood of Santa Catalina and discover the nightlife of Palma. Enjoy an ensaimada. Take an excursion along the wine route. Soak up history on the streets of Palma's old town. Conquer coves that you can only access by boat and much, much more. DO YOU FEEL LIKE SAILING AROUND MAJORCA? What do you need to rent a boat in Majorca? The yacht charter operators will ask you for a sailing license. In general, the most requested license in Spain to rent a sailboat around 12 meters length is the PER (Patron of recreational boats). We suggest you to inform about the requirements before hiring a boat. 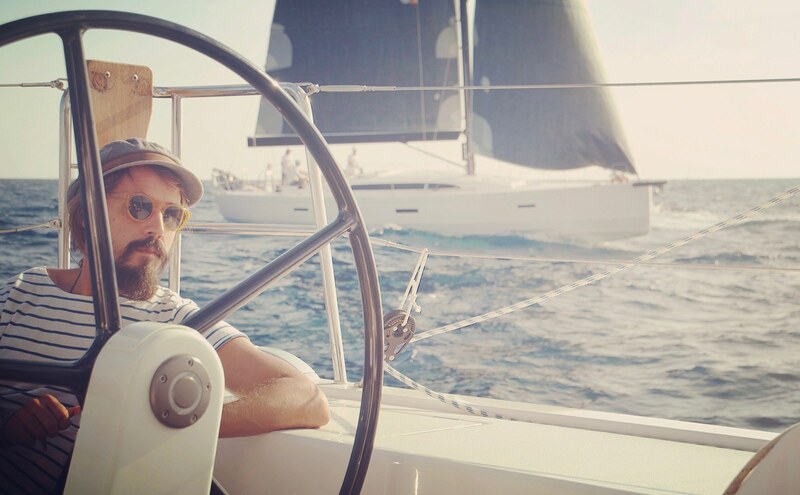 If you are not an experienced sailor and you want to enjoy your sailing holidays with no complications, the best thing you can do is to rent the boat with skipper. He will take care of everything and you will only have to worry about relaxing and having fun. After all, it's your vacation, isn´t it? Majorca is the largest of the Balearic Islands, an archipelago in the Mediterranean Sea, belonging to Spain, about 120 miles east of its nearest coast. The international airport of Mallorca is located just 15 minutes from the Palma downtown, and receives flights from many countries. You can also reach the island by ferry from Valencia or Barcelona. Its climate is nice, with soft temperatures. Storms are frequent in winter time, being the best time to sail the months between April to October. The predominant wind in the island is called Tramontana, and it comes from the north. In addition, from April to October almost daily, during the central hours of the day, a local thermal wind blows. It is called embat by the Mallorcans sailors and will delight you. The port of Palma is divided into several marinas. Many boats waits to be hired there. Yanpy offers the best yachts for charter to sail around Majorca. The sailing trips usually take a week and start around 17:00. During the morning, you can buy the provisions or take a walk and discover some treasures of the city. The old town of Palma is a labyrinth of narrow streets and cobbled walls full of history. Ancient civilizations, like Romans or later Muslims, left their mark among these stones. The imposing cathedral of Palma facing the sea, is the jewel of this old town. Definitely a walk that will transport you to another time. After this nice morning walk, we will go to the marina, where our skipper, in case of having hired him, and our boat await us eager to begin this adventure. Sailors on board! It's time to set sail. Our sailing holidays around Mallorca are about to begin. We will sail for a week by the Mediterranean Sea discovering the wonderful south coast of Majorca. We will sail an average of 4 hours a day. This will allow us to have time to relax and enjoy our holidays. We leave the port of Palma. Our skipper will head course SSE to Cabo Blanco. Our compass will turn again to E heading to our destination today, the paradisiac beach of Es Trenc. Es Trenc is an extensive white sandy beach and crystal clear waters. Behind that, an extensive pine forest forms a very Mediterranean landscape. Around Es Trenc you will find other beaches of similar beauty like Sa Ràpita or Ses Covetes. Es Trenc rivals the famous Illetas beach in Formentera for the title of Spanish caribbean. We will arrive at sunset, on time to anchor and enjoy a swim in a turquoise water hard to believe. At this point, you may already be thinking that this vacations on boat has already been worth it. Alternative: If the weather does not allow us to make a quiet free anchorage, the Marina of San Carlos de Sa Ràpita will allow us to spend a easy night. Note: Don´t miss out the chiringuito S´Embat in Ses Covetes beach. It´s a magical place hidden inside the pine forest. In the evenings you can enjoy outdoor live music and a tasty barbecue of grilled vegetables in a relaxed and very good mediterranean vibes. This will be an easy sailing day trip. Perfect to enjoy a relaxing time in some of the most beautiful coves in Majorca. We will sail heading to SE until leaving behind the Cape of Ses Salines. During this journey we will pass Es Caragol beach, a little crowded jewel, due to reach it from land, there is a good walk on foot. Luck that you have rented a boat... Es Caragol will be ideal for anchoring for a while and having breakfast in paradise. Passed by Ses Salines, our yacht will sail NE to our destination today, the picturesque Cala Figuera. But not so fast, we have a whole day ahead to enjoy our sailing vacation with our family or friends. At this point you will have to make a difficult choice, you will pass through four of the most spectacular coves on the island. Cala Marmols, cala s'Almunia, Caló des Moro and Cala Llombards are the whims of nature. Small coves where rock, pine forests and crystal clear waters make a perfect match to form unique landscapes. Try your best poses, today you will have many selfies to send. Anchor in some of them, or better in all. It's your vacation. Relax and enjoy. Cala Figuera will be the perfect place to complete our second stage. A natural anchorage sheltered from all winds. A picturesque cove with old fishing houses and llaüts moored. A very Mediterranean corner where it seems that time has not passed. We continue our route sailing along the east coast of Mallorca. Our boat will weigh in Cala Figuera heading to the natural park of Mondragó. This park, formed by a wild pine forest and endless routes for hikers, groups several paradise coves. We will sail to Cala S'Amarador to enjoy a swim in its crystal clear waters. After washing our faces in the sea, as good sailors, we will put our compass head to Cala Varques. From this point, our return jorney will begin. But do not worry, you still have many days of vacations and experiences sailing around Mallorca. Want to find a yacht to sail around Majorca? The east coast of Mallorca is famous for the beauty of its coves. Many of them are totally virgin, since the difficult access by land keeps them intact. Cala Estreta or Cala Bota are two good examples of small pieces of heaven on earth. Take advantage that you have rented a boat in Mallorca to take on some of these caprices of nature. Without any doubt, a perfect place to sunbathe, and relax with the soft sound of the waves. Around mid-day we will get Cala Varques. It will be the time to enjoy a seafood meal on board. I don´t know if you've noticed, but everything tastes better at the sea. Cala Varques is totally unspoilt. On land, surrounded by a majestic pine forest. By sea, surrounded by cliffs of capricious shapes. This wild cove of fine sand and crystal clear waters, offers a great time for all audiences. You can discover the local marine life by snorkeling, free climbing on the cliff walls or exploring the hidden caves in the surroundings. Each year, a group of nice hippies takes it as their summer residence. They make great mojitos. Have one! In the evening, when the sun stops biting, they go out to the beach to practice all kinds of juggling. Secret: Only 10 min walk from Cala Varques, following the cliff line you will find another caprice of nature. An arch-shaped cliff, where adrenaline junkies practice bungee jumping. Yes, you are right. You may be thinking that these are too many experiences in a day, but the final surprise awaits you. In the evening, we will head to SO, to anchor in Cala Sa Nau. Another spot that you shouldn´t miss out in your boat trip around Mallorca. A narrow cove, very protected, that will serve as a natural port. It has a chiringuito on the sand, where we can enjoy a good fresh grilled fish. It´s summer, the weather is perfect, the candlelight illuminate the cove, which now it´s very calm, almost looks like yours. You are barefoot in the sand, having a world class tuna with your friends or family under some pines and the stars. Your boat is anchored a few meters away. We have no doubt that you are thinking that these sailing holidays around Mallorca will be something you will never forget. All hands on deck! Our sailing trip around Majorca is in its half way. Our yacht leaves Cala Sa Nau to the SO, straight to the archipelago of Cabrera. Today we will have a trip to enjoy sailing. Finally hiring a skipper looks like a good idea. The National Park of Cabrera is an experience that you can not miss out in your boat trip. This archipelago, made up of 19 islands, is one of the most beautiful natural parks in Spain. Cabrera is a peaceful place to connect with the nature that surrounds you and recharge your batteries with good vibes. They say that the island has the most transparent waters of the whole Mediterranean sea, so put on the glasses and fins, it´s the right moment to spend a good time discovering the rich marine life. In the evening, you can take an excursion. The island offers numerous hiking trails to enjoy its virgin mediterranean forests. Cabrera is also an island full of history. Carthaginians and Romans left their mark. Berber pirates dominated its waters. And its darkest episode, when the island became a natural prison for several thousand French prisoners of the war of Independence, were abandoned to their fate. Note: Don´t forget to visit the castle and the blue cave. Cabrera is one of the safest natural ports in the Mediterranean. Protected from all winds will allow us to enjoy a magical night. You will fall in love with the its peace. Important: In order to visit the island and spend the night anchored in a buoy, it is necessary to get a permit from the Park Office. Most yacht charter companies in Mallorca can help you to manage the permit. Good morning sailors! Today we have ahead the longest sailing stage on our route around the south coast of Mallorca. It is a beautiful day. The sea is quiet. While our boat is sailing course Cala del Mago, it´s the perfect time to enjoy the sun, the sea breeze and the sound of the waves. Long time ago you dreamed of this mediterranean style sailing vacations. Bring the selfie stick out and take some pictures with your friends. It's time to put your social networks on fire. Tip: From time to time you take a look at the sea, it´s likely the dolphins play with you during the day trip. The beauty of Cala del Mago and its neighbourg Portals Vells will leave you breathless. The pine forests bathe in their crystal clear waters. The nature is exuberant. These coves are Mediterranean to the fullest. It's time for a dip in that turquoise water. It looks like a pool. After that, take that explorer soul you have inside out, the "Cova de la Mare de Déu" will be the icing on the cake of an excursion along the path that borders the sea. Did you know this cave was a quarry and that the extracted stone was used for building the Cathedral of Palma? The cove is quiet and excellent for anchorage. These two coves will allow us to enjoy a dinner in our boat under the light of the stars. If you prefer, both coves have a beach bar where you can enjoy some local food. Cala del Mago is a charming corner where our fifth day of sailing holidays around Majorca comes to the end. Today is our next to last day sailing around Majorca. We will sail along the southwest coast to get the island of Sa Dragonera. The south coast of Majorca is undoubtedly the crowded and urbanized on the island. Many of its beaches and coves have lively chiringuitos, restaurants for all tastes and some of the most exclusive beach clubs on the island. If after several days of relaxing sailing you feel like some party, today is the perfect day. Our yacht will sail close to imposing cliffs, which from time to time will discover turquoise water pearls. During the day, Costa de la Calma, the peaceful Malgrats Islands, Camp de Mar or Cala Llamp will be perfect stops to enjoy a swim. Do you fancy a paella? The restaurant S`Ileta on the islet of Camp de Mar will serve an delicious one. At sunset, the Chiringuito de Costa de la Calma or the exclusive beach club Gran Folies in Cala Llamp will play a chillout soundtrack to an amazing sunset. If you´d rather enjoy a more private sunset with your family or friends, from Sant Elm and Sa Dragonera you can see how the sun get lost in the sea in a show that will thrill you. The Natural Park of Sa Dragonera is an extension of the Sierra de Tramontana that broke up from Mallorca. This island is located a few meters from Sant Elm, a small fishing village that still retains the charm of older times. From the mooring of Cala Lladó, many paths lead you to discover one of the wildest corners of Majorca. Whenever the weather conditions are good, we can anchor to enjoy a quiet night in one of the natural anchorages of Sa Dragonera (mainly Cala Lladó). Alternative: If conditions are not good enough, we can take shelter in the port of Andratx which is less than 3 miles from the area. Today is the last day of our sailing holidays around the south coast of Mallorca. Our skypper will set sail to the cape of Cala Figuera. There he will adjust the sails to sail the bay of Palma to our final destination, the port of Palma. Along the way, the island still hides some treasures to discover. Cala Cap Falco is a beautiful cove. Guarded by narrow cliffs dotted with pine trees. A hidden corner very Mediterranean, where the trees give a pleasant shade to a chiringuito that will delight us with their mojitos, their grilled meats and fresh fish and its chillout music. In the last miles of our boat trip, we will pass by some of the most famous coves in the area around Palma. The beaches of Punta Negra, only accessible by boat, or Illetas, can welcome us for our last dip. Finally, our boat will bow to the Marina of Palma, where the next morning we will checkout. Palma is a city with a vibrant nightlife. The neighborhood of Santa Catalina has plenty of restaurants with cuisine from almost every corner of the world. We recommend the delicious tacos of El Aquanauta, a taqueria frequented by surfers and seafarers with the best flavor of the Pacific, a place with very good vibes. If you are so excited by the amazing experience of your sailing week in Mallorca that your body will not let you go sleep, you are lucky. Santa Catalina and the boardwalk are crowded of bars, pubs and exclusive nightclubs. Pacha, is a good option to put an end to an unforgettable vacation, where you can dance in front of the sea until you drop. We are pretty sure after this sailing week around Majorca, you are going to deeply fall in love with this island. You will dream of come back to swim in its turquoise waters, lose yourself in its forests and dance on its beaches. But don´t worry, this little paradise of the Mediterranean will be waiting for you. Next year you can repeat ;). What do you think about our route to sail for a week along the south coast of Majorca? If you liked this post, don´t be shy, share it with your friend. Our leave us a comment, we will love to meet you. Need to be in Palma de Mallorca Majorca on the 02 May 2018 - have time to spend thereafter. Whats a chance of joining a group to sail around the island. Hi David, thanks for your comment and your interest in renting a boat. At the moment we don´t offer yacht charters for cabins, but maybe we can find a nice sailboat or motorboat for you to discover Majorca. We will contact you by email to check your requirements. Kind regards, The Yanpy team.